If you are planning a winter getaway to Mt Robson, we already know you have an adventurous spirit. To continue our theme of extreme and unique winter tours and activities, this blog is about the Canada’s oldest form of winter transport. What better way to venture deep into the heart of the Canadian Rockies than behind a team of enthusiastic & friendly Alaskan Huskies? 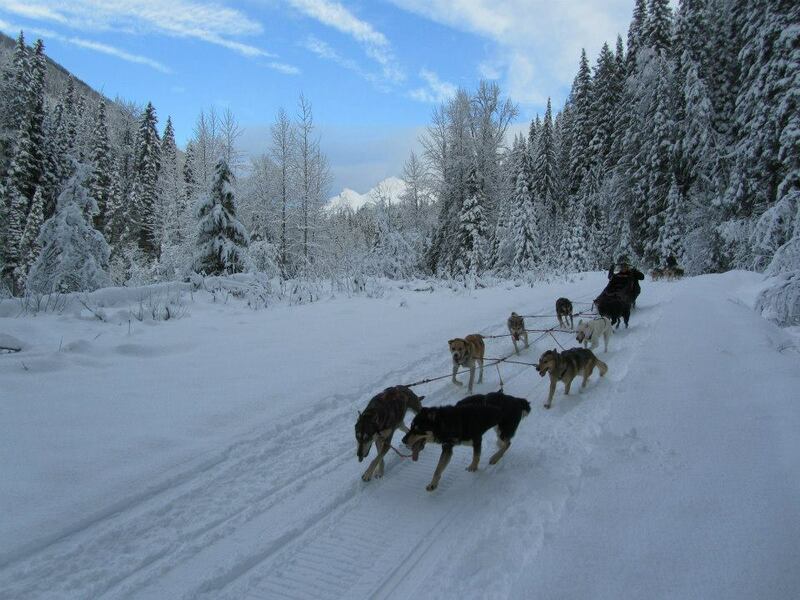 That’s right, we are talking about exploring Mt Robson Provincial Park via dogsled! Of course, the panoramic views and marvelous beauty of snow capped timbers, frozen waterfalls and icy creeks will thrill the viewer. The dogsledding tour company is Cold Fire Creek. They strive to provide an exhilarating & safe dogsledding experience. Cold Fire Creek has professional guides that can teach you all the aspects of driving a dog team of your own. You can participate as much or little as you like. For the animal lover, this could be the experience of a lifetime. Cold Fire Creek offers four different tours. The ’60 Minute Musher’ is a good tour for groups or those with young children. The three hour tour, ‘Moonshiners of Whiskey Creek’ includes a lunch cooked over an open campfire. Guides inform riders about the history of the area and the art of dog sledding. The 4.5 hour tour ‘Ghosts of Cold Fire Creek’ ascends 1000 feet along a 100-year-old trap line. This tour gives riders a look at how trappers and prospectors explored this mountainous territory. Enjoy a hot lunch in a log cabin along the Small River. The ‘Moonlight Run’ tour sounds truly magical – take a sled ride underneath the full moon! See the landscape glisten like never before. This trip lasts three hours. Costs for an adult ticket range from $125 to $290, depending on the tour you take. Contact Cold Fire Creek for more information and reservations.